Silver Canadian Maple Leaf coins feature iconic Canadian images and serve as the official silver bullion coins for the country. Issued annually since 1988 by the Royal Canadian Mint, the Silver Maple Leaf includes the nation’s official symbol of the sugar maple leaf on one side, with the effigy of Queen Elizabeth II on the obverse. 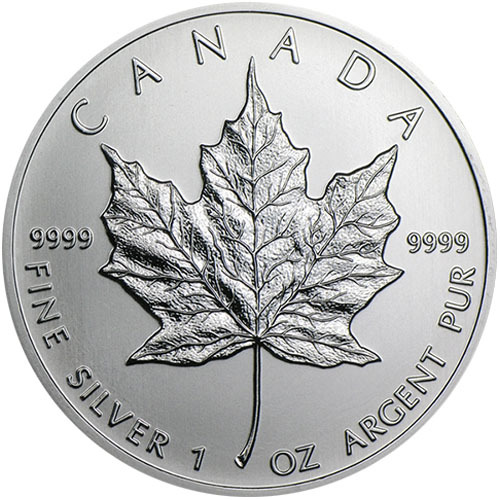 The 1990 1 oz Silver Canadian Maple Leaf Coin is currently available to you for purchase online at Silver.com. Ships to you inside a protective plastic flip! Third release year of the Silver Canadian Maple Leaf! Mintage total of 1,708,800 coins in 1990! Consists of One Troy ounce of .9999 fine silver in BU condition. Issued a face value of $5 (CAD) by Canada. The new third-generation portrait of Queen Elizabeth II on the obverse. Walter Ott’s original sugar maple leaf design on the reverse. The 1990 Silver Maple Leaf coin sunk back down in terms of mintage during its third year of availability. Debuting with a mintage of 1.062 million coins in 1988, the second year of availability was met with a significant uptick in demand to 3.332 million coins in 1989. For 1990 though, mintage was cut nearly in half with demand falling to 1.708 million coins. With the drop of the 1990 Silver Canadian Maple Leaf’s demand and mintage, the program was headed on a largely downward trend through the end of the 20th century. Mintage continued to drop in the years to come, falling in 1991 and 1992 before experiencing a brief uptick in 1993 and 1994. The fall restarted though, with coinage from 1994 to 1997 falling from 889,946 to an all-time low of just 100,970 in 1997. On the reverse of the 1990 Silver Canadian Maple Leaf Coins you’ll find the image of a sugar maple leaf. The nation’s official symbol, this design is that of the original maple leaf created in 1979 by Walter Ott for the gold version of the coin. It is accompanied by inscriptions of the coin’s nation of issue, purity, metal content, and weight. 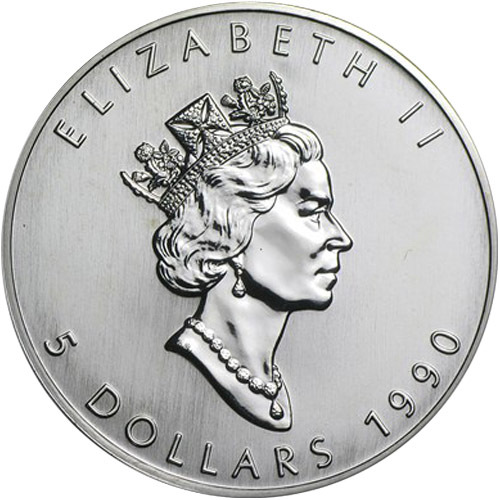 The obverse of the 1990 1 oz Silver Maple Leaf features the first new effigy of Queen Elizabeth II in the short-lived issue of the series. The 1988 and 1989 coins had the second-generation effigy, but these 1990 Silver Maple Leafs featured Dora de Pedery-Hunt’s third-generation effigy. Capturing the Queen at age 64, this design was the first created by a Canadian artist and featured on the coins through 2002. We encourage Silver.com customers to reach out to us with questions at 888-989-7223. You can also connect with us online through our live chat and email options. Live spot silver prices are also listed on our website and updated constantly!